Sam Allardyce is out at Newcastle, which is a good thing, because he’s been sacked in spirit for so long now that I was starting to worry he might zombify in the middle of a match. Newcastle are of course portraying the decision as one reached by “mutual consent,” which is always the phrase that seems to float out of the football world when one party is happily looking toward the future and the other is curled up like a pile of discarded laundry on the bathroom floor. Not that I’m saying who’s who in this situation, of course. The owner of the Toon, the cuddly billionaire Mike Ashley, will now have to decide whether to deal a crushing blow to intelligent football commentary by luring Alan Shearer away from Match of the Day, or start searching elsewhere for a replacement (one commenter on the Times football blog suggested Arsène Wenger, who I think we can all agree would be an excellent choice, assuming Rinus Michels isn’t available), or, given that he’s Mike Ashley, dressing up in a Philadelphia Flyers uniform and making snow angels in his secluded pleasure garden at the entrance to the caves of Xanadu. Bookmakers have yet to release odds, but I’m starting to calculate them for myself. 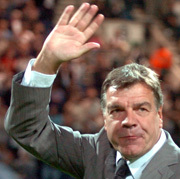 It’s hard to say what would be a good next move either for Newcastle or for Allardyce. I’m not radiant with faith in the ability of Alan Shearer to turn around a club as deeply and weirdly troubled as Newcastle in his first managerial job, but then again, the Mourinhos of the world aren’t likely to be tempted by the opportunity. As for Allardyce—well, it’s been a difficult eight months. If you own a De Lorean capable of reaching 88 miles an hour, and you’d be willing to point it in the direction of Bolton, I think you could name your price. One other quick thought: For Newcastle, what about Didier Deschamps? We know he wants to coach in England, and he’s a bit more proven than Shearer. He’d be less familiar with the culture of the club, obviously, but I can’t really see that as anything but an asset. The caveat here is that I hardly saw any of Juventus’s games with Deschamps in charge, so this is an intrigued query rather than an informed endorsement. But I wonder, if Newcastle are really going to go after Shearer, if there’s any reason to think that that would be a better move than just bringing Glenn Roeder back? This hurts, I’m not gonna lie. My affection for Newcastle has waned (self-preservation won out) over the past few years, but their constant absolute shambles is just jaw-dropping. And, you know, then it goes and gets worse. I have a little girl’s adoration for Alan Shearer (despite being one neither now nor when I first discovered him), but how could that possibly be a good thing? Wait. What’s Jose Mourinho up to? Does he speak Geordie? Kevin Keegan’s the man for the job, surely? The only reason for Newcastle to hire Shearer is for them to get their collective mancrush out of their system. He might well get them relegated, but once that happened, they could start over. Deschamps did what he was hired to do with Juve, and did it with a certain grace (he says through gritted teeth). It wasn’t terribly pretty, but Serie B is not a pretty league, even if you have four World Cup winners in your side. And he seems to like challenges. But going from Buffon and Del Piero to Joey Barton and Alan Smith is more than a challenge; it’s a deathwish. They should try very hard to get Martin Joh. He knows the league and is used to dealing with clubs steeped in delusions of grandeur, having done with the one I support for several years. Ursus, I’ve been assuming that Jol would be, or would at least feel himself to be, out of Newcastle’s league. I agree that he’d be a great catch, although he hasn’t exactly excelled at dealing with murky corporate situations, and my sense is that there are plenty of those around Mike Ashley. Tom, I’d forgotten about Kevin Keegan! I’m not sure whether that says more about me, or more about Kevin Keegan. I’d say he was an intriguing choice, but I can’t shake the feeling that the club needs someone with no Newcastle roots. There’s a strange dye in those roots at the moment. Keegan it is, then, if only in hope of another “I will LOVE IT if we beat them!” moment. The news tonight is that Shearer doesn’t want the job and Harry Redknapp is the “hot favorite” for it. So I guess the question now is…are we about to see a new level to the madness of Harry Redknapp? Oh please let it be so. It would only get funnier. Newcastle will never get anywhere until they learn to bring their ambitions a little more in line with reality. I’d never want to deny a club their dreams (well, maybe Spurs) but perhaps if the dreams were just a little more plausible, the club and the fans might get a bit further. Of course, no-one dreams of stability and patience, they’re rather unromantic. But, at risk of stating the obvious, they are plainly necessary. Is it any coincidence that Everton’s good performances and solid standing are coming at a time when their manager is now the 3rd longest serving in the Premiership? I almost think that it doesn’t matter much who Newcastle choose, just that they give him a couple of years to settle in and make a go of things. The news this morning is that Harry Redknapp has decided to stay at Portsmouth. He may be less completely insane than we thought.